You remember when you first laid eyes on your backyard – the ideas you got, the excitement and plans. But now, you’re not sure what to do. Whether it’s adding a golf practice area to perfect your swing, or designing an oasis with water and stones, rest assure the opportunities of what you can do with your existing backyard are limitless. 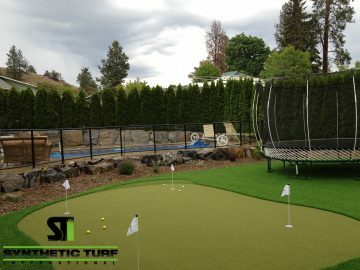 Creating a backyard putting green to go a few rounds might sound a bit basic – a tee box here and maybe a bunker there. But creating a putting course, with, for example, multiple holes, lighted cups or down lighting for night use, could really enhance your yard space. Also, what makes this project the go-to, is that it’s not only fun and enjoyable, but it provides hours of exercise with family, loved ones and friends. The maintenance and upkeep are minimal, too. 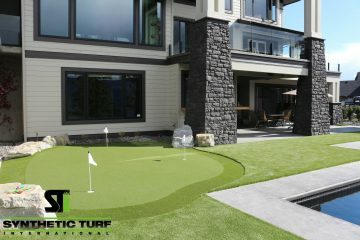 The owners of a home in Oahu’s North Shore in Hawaii, a place known for big wave surfing and top-ranking golf courses, according to Forbes, knew what they were going for when they tapped Synthetic Turf International to create a space that looks fresh-cut just like the pros. Contractors can offer various putting surfaces to match the aesthetics you want, from shorter first cut collars and fairways to taller dense fibers that simulate roughs. Although there is golfing for adults, children can get in on it, too – with the creation of a playground space. 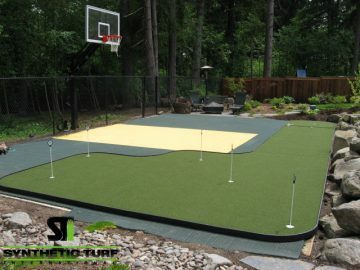 And a backyard putting green is a space that’s not only fun – but safe and long-lasting. Families and schools can add everything from color to engage the child’s senses, or keep it simple with a fresh-cut product that’s easy on the knees. Companies, like Synthetic Turf International, offer customers a turf product that comes in a variety of colors. If your idea of fun is more along the hosting kind, then a patio with grilling station and pergola might be the best solution for your space. 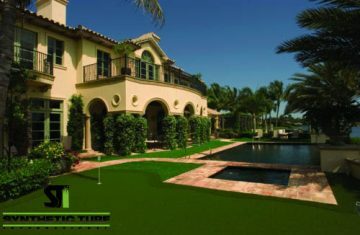 Using a variety of backyard putting green turf styles, such as Synthetic Turf International’s Kentucky Blue Plus for a natural-lawn look, or adding colors with a SoftLawn Pro Cut, you can create different stations and pathways. And for the most fun suggestion of all, do nothing but enjoy the inherent simplicity and low maintenance of a backyard putting green. Very little is required to appreciate the always fresh and clean feel of your space. It’s because of this that backyard putting greens are becoming increasingly popular as additional entertainment spaces for families and friends. The most common misconception about backyard putting greens is that they cannot simulate natural greens, and that they will look like the older carpet styles previously available. But with the right contractor support, like that of Synthetic Turf International, you’ll be able to have a putting area that’s designed to perform and look like natural greens from the putting surfaces to the fringes and roughs. Carolina Pichardo has been an editor, writer and producer for several award-winning publications and websites, including Parents.com, Advertising Age, DNAinfo New York and Everyday Health. She lives in New York with her husband and two kids, who are currently trying to dissuade her from pursuing a career as a professional potter.